Configuring Contact Wolf for Network Sharing is EASY! We have included a built-in menu option in the software to make all the necessary Network configuration changes for you. Follow the Step by Step Instructions below to share the Contact Wolf database on your network. 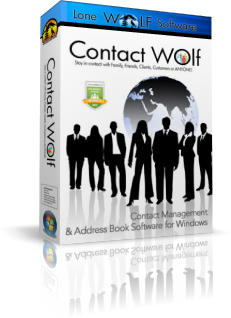 Install Contact Wolf on EACH computer under the Users account that you want to use the software and share the database. Note: Contact Wolf should NOT be installed on the Network Server. It should be installed and registered on each Users computer under their normal User account. must be in a Shared folder that ALL users are allowed access to. If your network uses a network server you can select a folder on the network server. If no server is available you can select any computer on the network to act as the server for the Contact Wolf database. The PUBLIC folder is normally shared by default to ALL users on the network and is a good choice. Contact Wolf includes a menu option to assign the Shared folder as the Database folder to be accessed. This process MUST be performed for EACH USER on the network from EACH USERS computer while running Contact Wolf from their User account. 2) Navigate to the Folder you want to use as the Shared Folder on the Network and click once on it to select and Highlight it. 3) Click OK to accept it. 4) Close Contact Wolf and restart it.